THE PERSONAL LOVE AND LEAD OF CHRIST. John x. 3.--"And he calleth his own sheep by name and leadeth them out." IN this parable, Christ is a shepherd, and his people are his flock. And two points, on which the beauty and significance of the parable principally turn, are referred to in the text, which might not be distinctly observed by one who is not acquainted with the peculiar manner of the eastern shepherds. They have, in the first place, a name for every sheep, and every sheep knows its name when it is called. And then the shepherd does not drive the flock, as we commonly speak, but he leads them, going before. To these two points, or to the instruction contained under these two analogies, I now propose to call your attention. I. He calleth his own sheep by name. As we have names for dogs and other animals, which they themselves know, so it was with the eastern shepherds and their flocks. This fact is shown historically, by many references. It is to this, for example, that Isaiah refers when he represents the Almighty Creator as leading out the starry heavens,. like a shepherd leading his flock;--Lift up your eyes and behold who hath created these things, that bringeth out their host by number; he calleth them all by names. The shepherd in this view is not as one who keeps a hive of bees, knowing well the hive, but never any particular bee in it, but he has a particular recognition of every sheep, has a name for every one, teaches every one to know that name and follow at the call. This also is signified in the words that immediately follow,--The sheep follow him, for they know his voice,--words that refer, not so much to the mere tones of his voice, as to the fact that he is able, as a stranger is not, to call the names they are wont to answer as their own. Under this analogy stands the tender and beautiful truth, that Christ holds a particular relation to individual persons; knows them, loves them, watches for them, leads them individually, even as if calling them by name. In this respect, the parable is designed to counteract and correct, what has in all ages been the common infirmity of Christian believers;--they believe that God has a real care of the church and of all great bodies of saints, but how difficult is it to imagine that he ever particularly notes, or personally recognizes them. They know that God has a vast empire, and that the cares and counsels of his love include immense numbers of minds, and they fall into the impression that he must needs deal with them in the gross, or as noting only generals, just as they would do themselves. They even take an air of philosophy in this opinion, asking how we can imagine that so great a being takes a particular notice of, and holds a particular and personal relation to, individual men. There could not be a greater mistake, even as regards the matter of philosophy; for the relation God holds to objects of knowledge is different, in all respects, from that which is held by us. Our general terms, man, tree, insect, flower, are the names of particular. or single specimens, extended, on the ground of a perceived similarity, to kinds or species. They come, in this manner, to stand for millions of particular men, trees, insects, flowers, that we do not and never can know. They are, to just this extent, words of ignorance; only we are able, in the use, to hold right judgments of innumerable particulars we do not know, and have the words, so far, as words of wisdom. But God does not generalize in this manner, getting up general terms under which to handle particulars, which, as particulars, he does not know. He is not obliged to accommodate his ignorance, or shortness of perception, by any such splicing process in words, His knowledge of wholes is a real and complete knowledge. It is a knowledge of wholes, as being a distinct knowledge of particulars. Indeed, whatever particulars exist, or by him are created, he must first have thought; and therefore they were known by him, as being thought, even before they became subjects of knowledge in the world of fact. Holding in his thought the eternal archetypes of kinds and species, he also thought each individual in its particular type, as dominated by the common archetype. So that all things, even things most particular, are known or thought by him eternally, before they take existence in time. When he thinks of wholes or kinds therefore--of society, the church, the nation, the race, he knows nothing of them in our faint, partial way of generalization, but he knows them intuitively, through and through; the wholes in the particulars, the particulars in the wholes; knows them in their types, knows them in their archetypes, knows them in their genesis out of both; so with a knowledge that is more than verbal, a solid, systematic, specific knowledge. Nay, it is more,--a necessary, inevitable knowledge; for the sun can no more shine on the world, as in the gross, without touching every particular straw and atom with his light, than God can know, or love whole bodies of saints, without knowing and loving every individual saint. In one view, it requires no particular act of tenderness, or condescension in him; it is the sublime necessity of his Perfect Mind. Being a perfect mind, and not a mere spark of intelligence like us, he can not fall into the imperfections and shorten himself to the half-seeing of our contrivance, when we strain ourselves to set up generals, in a way to piece out and hide our ignorance. And yet we could not wean ourselves of this folly, could not believe that our God has a particular notice of us and a particular interest in our personal history. And this was one of the great uses of the incarnation; it was to humanize God, reducing him to a human personality, that we might believe in that particular and personal love, in which he reigns from eternity. For Christ was visibly one of us, and we see, in all his demonstrations, that he is attentive to every personal want, woe, cry of the world. When a lone woman came up in a crowd to steal, as it were, some healing power out of his person, or out of the hem of his garment, he would not let her off in that impersonal, unrecognizing way; he compelled her to show herself and to confess her name, and sent her away with his personal blessing. He pours out, everywhere, a particular sympathy on every particular child of sorrow; he even hunts up the youth he has before healed of his blindness, and opens to him, persecuted as he is for being healed, the secrets of his glorious Messiahship. The result, accordingly, of this incarnate history is that we are drawn to a different opinion of God; we have seen that he can love as a man loves another, and that such is the way of his love. He has tasted death we say, not for all men only, but for every man. We even dare to say, for me,--who loved me and gave himself for me. Nay, he goes even further than this himself, calling us friends, and claiming that dear relationship with us; friends, because he is on the private footing of friendship and personal confidence;--The servant knoweth not what his Lord doeth, but I have called you friends. He even goes beyond this, promising a friendship so particular and personal that it shall be a kind of secret, or cypher of mutual understanding, open to no other; a new white stone given by his king, and in the stone a new name written, which no man knoweth saving he that receiveth it. Indeed, I might go on to show, from every particular work and turn of this gospel, how intensely personal it is. What is communion that is not communion with particular souls? Is it the communion or fellowship of God that he reaches only great bodies of men? If he promises comfort or support, whom does he comfort or support, when he touches no individual person? The promises to prayer--whom does he hear, when he hears the prayer of nobody in particular, and for nothing in particular? The work of the Holy Spirit in souls--what is it, in all its degrees and modes; in their calling, their guidance, their sanctification; what can it be imagined that he does which is not personal, the bestowment of a convincing, illuminating, drawing, renovating grace, exactly tempered to, and by, the individual blessed; a visiting of his intelligent person, at just the point of his particular want, sin, sorrow, prejudice, so as to exactly meet his personality at that particular time. We speak, indeed, of the Holy Spirit as falling on communities, or assemblies, but we must not suppose that he touches the general body and no particular person. On the contrary, if we understand ourselves, he reaches the general body only by and through individuals; save that there is an effect of mutual excitement, which is secondary and comes from their sense of what is revealed in each other, under the power of the Spirit in each. How then can it be imagined that God effectually calls any person by his Spirit, without dispensing a grace most distinctly and even adaptively personal? So it is, in short, with every thing included in the gospel as a grace of salvation; every thing in the renewing, fashioning, guidance, discipline, sanctification, and final crowning of an heir of glory. His Saviour and Lord is over him and with him, as the good shepherd, calling him by name; so that he is finally saved, not as a man, or some one of mankind, led forth, by his Lord, in the general flock, but as the Master's dear Simon, or James, or Alpheus, or Martha, whose name is so recorded in the Lamb's book of life. And, in this view, it is, I suppose, that the church, in baptizing her children, takes there, at the font, with a most beautiful and touching propriety, what she calls the "Christian name;" as if it were Christ's own gift; a name bestowed by him, in which he recognizes the child's discipleship, and which, as often as it is spoken, he is himself to recognize as the calling of his Master's voice;--And he calleth his own sheep by name. II. Point of the text--he leadeth them out. It is not said, you observe, that the shepherd driveth them out, for that was not the manner of shepherds, but that he leadeth them, going before to call them after him. This, indeed, is expressly and formally said in the next verse--and when he putteth forth his own sheep, he goeth before them, and the sheep follow him. Hence those poetic figures of the Old Testament--The Lord is my shepherd, he leadeth me beside the still waters. Thou leddest thy people, like a flock, by the hand of Moses and Aaron. Give ear, O shepherd, thou that leadest Joseph like a flock. The same custom of going before the flock pertains, even now, it is said, in the sheep-walks of Spain. What a beautiful image, or picture, to represent the attitude and personal relationship of Jesus among his followers;--That he does not drive them on before, as a herd of unwilling disciples, but goes before himself leading them into paths that he has trod, and dangers he has met, and sacrifices he has borne himself calling them after him and to be only followers. He leadeth them out. If driving could do any good, he might well enough drive his flock as a body, caring nothing for any one of them in particular; but, if he is going to draw them after him, he must work upon their inclinations, draw them by their personal favor to him, and must therefore know them personally, and call them to follow, as it were, by name. Just the difference will be observed in this matter that pertains between the eastern shepherds and those of the west, and north. No sooner do we come upon this latter fashion of driving flocks a-field, than we see the noting, knowing and calling of particular sheep disappear. When the driving and thrusting on before becomes the manner, there is no need of getting any one of them under a power of confidence and attraction, no need of noting them individually at all. So, if driving were in place, Christ might well enough let fall the fires of Sodom behind his flock and drive them out, as he drove Lot's family, or his vain hearted wife, out of the city. But the best use that could be made of such a flock, after all, would be to turn them into pillars of salt and let them stand. No disciple is a real disciple till he becomes a follower, going after the shepherd, as one that follows by name, and is drawn by love. Here then is the beauty and glory of Christ, as a Redeemer and Saviour of lost man, that he goes before, always before, and never behind his flock. He begins with infancy, that he may show a grace for childhood. He is made under the law, and carefully fulfills all righteousness there, that he may sanctify the law to us, and make it honorable. He goes before us in the bearing of temptations, that we may bear them after him, being tempted in all points like as we are, yet without sin. He taught us forgiveness by forgiving himself his enemies. He went before us in the loss of all things, that we might be able to follow, in the renouncing of the world and its dominion. The works of love that he requires of us, in words, are preceded and illustrated by real deeds of love, to which he gave up all his mighty powers from day to day. He bore the cross himself that he commanded us to take up and bear after him. Requiring us to hate even life for the gospel's sake, he went before us in dying for the gospel; suffering a death most bitter at the hand of enemies exasperated only by his goodness, and that when, at a word; he might have called to his aid whole legions of angels, and driven them out of the world. And then he went before us in the bursting of the grave and the resurrection from it; becoming, in his own person, the first fruits of them that slept. And, finally, he ascended and passed within the veil before us, as our forerunner, whom we are to follow even there. In all which he is our shepherd. going before us, and never behind; calling, but never driving; bearing all the losses he calls us to bear; meeting all the dangers, suffering all the cruelties and pains which it is given us to suffer, and drawing us to follow where he leads. And then we see what kindred spirit entered into the teachers that he gave to lead his flock. They were such as followed him in the regeneration; going up at last, according to his promise, to sit on thrones of glory with him. And it is remarkable that the apostles took it as incumbent on them always, in their Master's law, to require nothing of others in which they were not forward themselves. Thus, when Paul says, once and again--I beseech you be ye followers of me; brethren, be followers together of me; it has a sound, taken as it may be taken, of conceit, or vanity; but, when we look upon him as a man who goes after Christ, in the ways of scorn and suffering patience; in labors more abundant, in stripes above measure, in prisons more frequent, in deaths oft, receiving more than once his forty stripes save one, beaten with rods and stoned out of cities, running the gauntlet through all sorts of perils, in weariness and painfulness, in watchings often, in hunger and thirst, in fastings often, in cold and nakedness, accounted as the filth of the world and the offscouring of all things--when we see him tramping on heavily thus, bearing his Master's dark flag of patience and loss. and calling others to follow, we only see that he has taken Christ's own spirit and despises even to send the flock before him, where he does not lead himself. Ah! we have seen things different from this; teachers that bind heavy burdens and lay them on men's shoulders, which they themselves will not so much as lighten with the touch of their fingers; priests and confessors that feed their lusts out of the charities extorted from the poor, imposing on them loads of penance in turn, to humble them and keep them in subjection; philanthropists publishing theories and great swelling words of equality, and tapering off in the commendation of virtues they themselves do not practice, and even inwardly distaste. All such are men that drive a flock. But Christ, the true shepherd, the eternal Son of God, wants nothing in his flock that he does not show in himself. He goes before them, bearing all the bitterest loads of sacrifice and facing all the fiercest terrors himself, only calling them gently to come and follow. "Come unto me, all ye that labor and are heavy laden, and I will give you rest. Take my yoke upon you and learn of me. My yoke is easy and my burden light." The uses and applications of this subject are many. The time allows me to name only a few that are most practical. 1. A great mistake, or false impression, held by most worldly minds, and even by some who profess to be disciples, is here corrected; viz., the mistake of regarding the christian life as a legal and constrained service. It is as if the flock were driven by the shepherd, and not as if it were led by the shepherd's call going before. In this image, or figure, is beautifully represented the freedom of the disciple. He is one who is led by a personal influence, one who hears the voice and answers to the name by which he is called. He could not be thrust on, as in a crowd, by mere force, or fear. Christ wants to lead men by their love, their personal love to him, and the confidence of his personal love to them. And therefore the representation is, not that he is a shepherd going behind, with dogs, to gather in the flock, and keep them before him, but that he draws them after him, and gets them into such a training of confidence, that they will hear his call and follow. The whole relation, therefore, of discipleship is a relation of liberty. No one goes to his duty because he must, but only because his heart is in it. His inclinations are that way, for his heart is in the Master's love, and he follows him gladly. It no doubt seems to you, my friends, when you look on only as strangers to Christ, that this must be a hard and dry service; for you see no attraction in it. But the reason is that your heart is not in it. With a new heart, quickened by the grace of Christ, all this would be changed. It will then seem wholly attractive. All the currents of your love will run that way, and the freest freedom of your nature will be to go after Christ. No sacrifice will be hard, no service a burden. The wonder now will be that all men do not rush in after Christ, to be his eager followers. God grant that even to-day you may have this truth, as an experience, in the choice of Christ, and the renewing of his promised Spirit. Brethren, are there some of you that hold this same impression of the life of duty! If so, if you have no knowledge of this freedom in Christ, the sign is a dark one for you. Perhaps it is not exactly the same impression that you hold. It may be that you have it only in a degree, accordingly as you are over-legal in your conceptions of duty, and rob yourself, in that manner, of its comforts, Let your mistake be now corrected. See, in particular: that Christ is not behind you but before, calling and drawing you on. He wants your faith, wants your love, not a minute, and scrupulous, and careful piling up of legalities. You are not to stand off, doing something for him that he is to examine and report upon as accepted, by statute conditions; but you are to go after him, and be with him, and keep along in his train, feeding in his pasture, and following where he leads. This is the liberty, the beautiful liberty of Christ. Claim your glorious privilege, in the name of a disciple; be no more a servant, when Christ will own you as a friend. 2. 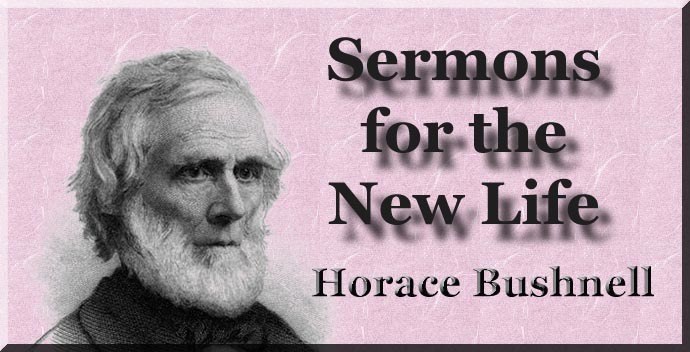 We discover, in this subject, what to think of that large class of disciples who aspire to be specially faithful, and hold a specially high-toned manner of life, but are, after all, principally strenuous in putting others forward, and laying burdens upon others. Christ, we have seen, goes before when he leads, and so did his apostles, calling on the saints to follow. But there is a cheaper way some have, in which they beguile even themselves. It is a kind of righteousness with them that they have such stern principles of duty and sacrifice. How greatly are they scandalized too by the self-indulgence, the parsimony, the show, the pleasures, the vanities of others, who profess the christian name. And in all this they may be sincere and not hypocritical. They only find it so much easier to be stiff in their judgments, and self-renouncing in their words and exhortations, that they slide over, only the more unwittingly, their own looseness and deficiency, in the very things they insist on. How many preachers of Christ fall into just this snare: pray for us, brethren, for our temptation is great. Christians of this class commonly have it as a kind of merit, and how many christian ministers repeat the same thing, that they never ask it of others to follow. them. God forbid that they should indulge in any such conceit as that! Yes, God forbid, indeed, the conceit, for it would be one; and, what is more, God forbid that others be ever found as their followers; and for just the reason that they do not follow Christ. They half consciously know it themselves--hence their modesty. Would they could also understand how great a thing it is in Christ and his first messengers, that they go before, to lead in all sacrifice and suffering; doing first themselves whatsoever they lay upon others. I believe, my brethren, that there are almost none of us who do not slide into this infirmity, complimenting ourselves on the high principles we hold, and the severe standards we set up, in our words and judgments, when, in our practice, we fall low enough to require some such kind of comfort, to piece out our evidence and satisfaction. And then we compliment, again, our modesty, that we do not propose to be examples to others! How much more and more genuinely modest should we be, if we judged only as we practiced and set forward others in words, only as we fortify words by example. Let us understand ourselves in this; that we are not what we talk, or stand for with our words, but what we do and become. 3. Consider, in this subject, what is true of any real disciple, who is straying from Christ; viz., that his Holy Shepherd, folding the flock and caring for it as a shepherd should, does not let him go, or take it only as a fact that the flock is diminished by one, not caring by what one. He knows what one it is, and, if the wanderer will listen, he may hear the shepherd calling his name. The love of Christ, as we have seen, is personal and particular, and he watches for his flock with a directly personal care. Do not imagine, then, if you consciously begin to fall off, or stray, that you are no longer cared for by the Shepherd. Christ follows you with his personal and particular love, and will not let you go. That same tenderness which melted the heart of an apostle, when he said--"who loved me and gave himself for me," pursues you still. It is faithful, patient, forgiving, and true; it waits and lingers, it whispers and calls, saying, "will ye also go away;" holding on upon you by a personal and persistent love, that will not be content till you are gathered back into the fold, to be, as before, a follower. And the same is true where the love of many waxes cold, and whole bodies of disciples are chilled by worldliness, or carried away by common temptations; it is not the mass only, or the general flock, that Christ regards. Each one he follows and calls, as truly as if he were the only one. The wrong they do him, and the grief he feels, is personal. By name and privately he deals with each, gathering him back, if possible, to prayer and holy living, to faith, and sacrifice, and works of love. By these private reproofs, and these tender and personal remonstrances, brethren, he is calling after all you that stray from him to-day. And, if you think you have personal apologies, or have been stolen away by temptations you could not detect, he knows exactly what is true, and will every true allowance make, and, as being faithful to you, he will make no other. Whatever grace you want to bind you up and establish you, he waits to bestow. He will not only forgive you; readily and completely, but he will embrace you heartily, and take you again to his confidence; the same sweet personal confidence in which you stood before. O, thou wavering, faltering, failing disciple I come thou, at his call, and see! Finally, consider the close understanding with Christ the ennobled confidence and dignity of a true discipleship. To be a disciple, is to have the revelation of Christ, and the secret witness of his love in the soul. It implies a most intimate and closely reciprocal state. According to the representation of the parable, the Holy Shepherd knows his own sheep with a particular knowledge, and calleth them by name; while they, on their part, know his voice and follow. A stranger will they not follow, but flee from him; for they know not the voice of strangers. And he also says himself,--I am the good shepherd and know my sheep, and am known of mine. O, this deep and blessed knowledge--the knowledge of Christ--to be in the secret witness of his love, to be in his guidance, to be strong in his support, to be led into the mind of God by him, and have our prayers shaped by his inward teaching; so to be set in God's everlasting counsel, and be filled with the testimony that we please him, this, all this it is to know Christ's voice. Happy are we, brethren, if the sense of this knowledge be in us. And what can fill us with a loftier inspiration, or lift us into a more sublime and blessed confidence, than this,--the fact what Christ, the Eternal Shepherd, has a personal recognition of us, leading us on, by name, and calling us to follow. No matter whether he call us into ways of gain or of suffering, of honor or of scorn; it is all one, with such a leader before us. Nay, if we go down to sound the depths of sorrow, and ennoble the pains of sacrifice, and perfume the grave of ignominy, what are these but a more inspiring and more godlike call, since he is now our leader even here. O, my brethren, here is our misery, that we think to go above Christ, and find some cheaper way when, if we could truly descend to his level of sacrifice, and take his cross to follow, we should be raised in feeling and power, ennobled in impulse, glorified with him in his joy. After all, the secret of all our dryness, the root of all our weakness, our want of fruit and progress, our dearth and desolation, is, that we can not follow Christ. First, we can not believe that he has any particular care of us, or personal interest in our life, and then, falling away, at that point, from his lead, we drop into ourselves, to do a few casual works of duty, in which neither we nor others are greatly blessed. God forbid that we sacrifice our peace so cheaply. Let us hear, O, let us hear, to-day, the Shepherd's voice, and, as he knows us in our sin, so let us go after him in his sacrifice. Let us claim that inspiration, that ennobled confidence, that comes of being truly with him. Folded thus in his personal care, and led by the calling of his voice, for which we always listen, let us take his promise and follow, going in and out and finding pasture.